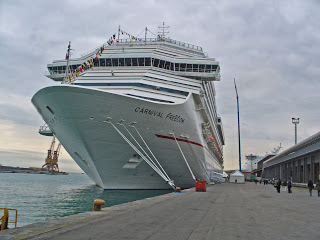 Georgia and I just got back from a 9 day Mediterranean cruise on the brand new Carnival Freedom. This was the ship’s inaugural cruise and quit an adventure for us. The itinerary for this first cruise was a little different than it will be for the regular schedule. Our trip from Chicago’s O’Hare to Marco Polo Airport in Venice was a reminder of just how bad airline travel has become. There is no real point to naming the airlines involved since we had problems on every leg of the trip, with every airline and, at every airport. The trouble really started when we booked our flight several months ago. We originally wanted to fly through London arriving in Venice about 4:30 PM but, a check with our representative at Carnival Cruise Lines made it clear that wouldn’t work. The last shuttle from the airport to the ship would be at 4:00 PM. We changed our planes to fly through Brussels arriving in Venice at 11:30 AM, plenty of time to get to the ship with a cushion for delays. The draw back was that it cost us an extra $440. Our overnight flight was scheduled to leave at 4:30 PM and arrive in Brussels at 7:30 AM local time. We would have 2 hours and 45 minutes to catch our connecting flight at 9:45. We got to the airport a little over 2 hours before the flight (as required for international flight), got through check in and TSA security in 15 minutes then just sat and waited for almost the full 2 hours. We boarded the plane right on time and pushed back from the gate at exactly 4:30 – looking good so far. We taxied out, made a left turn, another left turn and then another left turn. At that time the captain came on the intercom and announced that we were taxiing back to the gate because one of the air conditioning units wasn’t working properly. He expected no more than 20 minutes delay. Two hours later, after maintenance replaced a controller board, we finally taxied out again and took off. Our time to make the connecting flight wasn’t looking so adequate now. 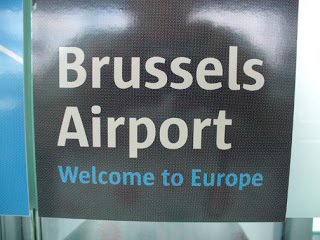 By the time we landed in Brussels, taxied to the terminal and got off the plane, we only had a half hour to make the next flight. Georgia has difficulty walking for various reasons including foot surgery she had some time ago. A gate agent told us that the departure gate was too far away for us to make it unless we ran very fast (not happening) and we would have to be re-ticketed on a later flight. The next one was at 2:30 and would get us to Venice at 4:30. We told her that that was too late to get to our ship so, she found us a flight on another airline that would get us there by 3:45 but, we would have to change planes in Milan. I called Carnival and they said that as long as our flight landed by 4:00 PM, we could make the shuttle. We had no choice but to go for it. She found a wheel chair for Georgia and we went to the ticket counter to get our new boarding passes. We still had to hurry to make the new flight but, with the wheel chair, we got through security and to the gate with a couple minutes to spare. Well, actually many minutes to spare since this flight was late leaving too. No explanation of why, just another half hour delay. When we eventually got to Milan, there was another wheel chair waiting for us. A young man wheeled Georgia into the terminal then parked her off to one side and said someone else would be there in 5 minutes to take us to the gate. We would have time because this flight was delayed 15 minutes. We waited 5 minutes, 10 minutes, 15 minutes and nobody showed up. I went over to an airline representative with a radio in his hand and told him what was going on. Sorry, he had nothing to do with wheelchairs. Could he use his radio to check? No but, if we went upstairs, we would find a customer service counter not far away. I pushed the chair over to an elevator and up we went. We never did find the customer service desk but, I saw a sign pointing to our gate so headed toward it. Another security check, a couple more elevators and a lot of fast walking got us to the gate just in time to hear a PA call for boarding. We got in line and waited and waited and waited. Nothing was happening because there was no one at the gate to check us through. I noticed a Carnival tag on a suitcase in the hand of the lady in front of us. It turned out there were six other Carnival Freedom passengers in line with us. They had come by a different route but had also been delayed and, they too, were worried about being too late to make the shuttle. We finally boarded the airplane, took off and got to Venice a little after 4:30PM. The same time we had been scheduled to arrive on the first flight we had planned to take and that would have saved us $440. Now we had to get our luggage and get through customs. One of the men went out through the doors and found that Carnival still had a bus there waiting for late passengers like us. Apparently there were a great many. We could still make it after all. Our luggage started coming in and, we found 3 out of 4 of our bags. Now we had that to deal with. The one we were missing was a garment bag with my suits and Georgia’s dresses that we had packed to wear to dinner. I went to the lost luggage counter where I was at the end of a long line. It took another half hour to get to the counter and make out a claim. The woman at the desk took the claim check for the missing bag and scanned the bar code. The suitcase had not arrived in Venice. No surprise there but where was it scanned last? She didn’t know because she could only check what was scanned at this airport. Why is it that FedEx can track millions of packages anywhere in the world in minutes while an airline takes hours or even days to track a suitcase that they lost? We finally got out of the baggage area and turned our reduced luggage load over to the Carnival porters who advised me to let the ships purser desk know about the missing bag, got on the bus and headed for the ship. The difference in how the cruise lines treat their customers compared to the airlines is like night and day. The cruise lines have the attitude that you are their guest and that their job is to make your visit with them as easy and pleasant as possible. Maybe the airlines could take some lessons. The last bad luck of the day came when we got to the dock. As we were starting up the gangway, Georgia fell and hurt her knee. One of the crew members brought her a wheelchair and asked if she wanted to see the ships doctor. She didn’t think she was hurt very badly so declined the doctor but, we kept the chair to get to our cabin. By now, it was almost 7:00PM so; we got a little to eat on the Lido deck. Then to the purser’s desk where they copied my passport, luggage tags and lost baggage claim. I also signed a paper giving Carnival permission to act as our agent to locate and accept our lost bag. They told me to just relax and let them handle finding it. They would stay on it until it was located. It had been quit a day so; we went back to the cabin where the porters delivered the rest of our luggage. We unpacked and unwound for a little while before turning in early. The ship was staying in port the first night so we would have time to see Venice the next day. The return flight, which I will cover in an upcoming post, was less of a nightmare but, only because we didn’t have a schedule to meet. When I thought about why our experience on this occasion was so much worse than on other flight we have taken recently, I realized that, over the last few years, we have made changes to our travel patterns to compensate for the airlines short comings. We take direct flights whenever possible to avoid missed connections and, we always travel a day ahead of any planned activity to make sure that we are there on time. Of course, that means an extra night in a hotel on every trip. In short, we pay more money than we should have to just because we can not depend on the airlines to get us from point A to point B on schedule. When we got up the next morning, Georgia’s knee was stiff and hurting a little. She opted to stay on the ship while I went into Venice to do some exploring. I caught a shuttle bus from the ship to Piazzale Roma where I got on a water bus (a vaporetto) for the trip along the length of the Grand Canal to Saint Mark’s Square (Plaza San Marco). Vaporettos are a great way to see the city. For about 12 Euros, you can get an all day pass that allows you to get off and re-board at any stop along the route. 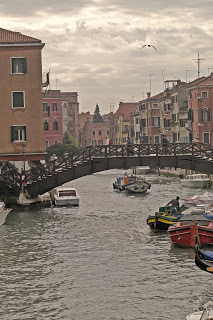 Venice is so different from other cities that there is something amazing to see everywhere you look. I kept my camera snapping for the whole length of the canal. At Saint Mark’s Square, I got off the vaporetto and walked around for a while. The square was crowded but not as much as it would be at the height of the tourist season. After a half hour or so, I boarded another water bus for the return trip along the canal. This time I got pictures of the other side. I got back to the ship in time to have some lunch before the ship sailed at 3:00pm. At a little after 2:00PM, we were back in the cabin when there was a knock on the door. It was a porter with our missing suitcase. Carnival had come through for us. Just before the ship was due to sail, the usual life boat drill was held. The, as the ship pulled away from the dock, we took seats out on our balcony. Our elevated position on the seventh deck gave us a great vantage point to watch the city as the ship sailed past and out to sea. We opened our newly rescued garment bag and dressed for dinner. The Freedom has two dining rooms and two seatings in each. We were in the Posh dining room with a 6:15 seating. Since we had missed the night before, this was our first meeting with our table mates Don and Toni. They were pleasant company on the nights we ate in the dining room. After dinner, we went to the main show lounge for the cruise directors port of call talk then to our cabin to turn in for the night. We we due back in the lounge at 9:00AM for a tour of Dubrovnik, Croatia. Croatia is an interesting country and, no doubt, pleasant on a warm summer day. Today was kind of dreary with clouds and periodic light rain. It has been 15 years since the Croatian War of Independence but signs of the conflict are everywhere. We saw many shells of houses, hotels and commercial buildings that have still not been rebuilt or repaired. Our tour guide, Anaca, referred to the war often. It is still fresh in the minds of the Croatian people. Our motor coach drove us through the city of Dubrovnik and out into the countryside. We made photo stops at spots along the coast with some spectacular scenery. 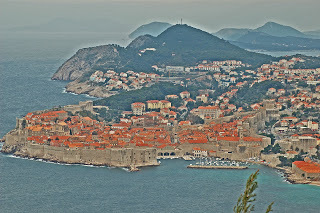 The overview of the walled old city of Dubrovnik was especially worth seeing. We made a lunch stop at a restaurant hidden way down a winding road in a small agricultural village. The site was along a river with water wheels and lush greenery. Our meal was typical Croatian fare served by waitresses in traditional costumes. The last stop, for us, was at the little village of Cavtat. There is a nice sea side walk way and some typical tourist shopping here. It started to rain a little right after we arrived so we were pretty much confined to indoor activities, namely shopping. Back in Dubrovnik, we had the choice of staying in the city for an hour or so and going back to the ship on a city bus or continuing back to the dock on the tour bus. Because of the rain, only a couple people elected to stay in the city. The rest of us went on back to the ship. Tonight was the first formal dinner night. We got dressed early and had several pictures taken on the way to the dining room where the featured menu choice was lobster, one of Georgia’s favorites. 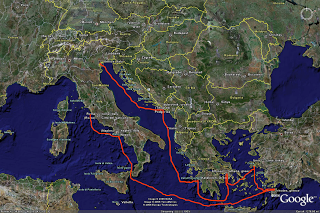 Next port would be Katakolon, Greece. I will cover it in the next post.